This resource book for End Users is an outstanding tool to help your users maximize their utilization of SharePoint and build exciting and useful functionality. Providing over 116 detailed examples, this guide will be the best resource for End Users to use in their pursuit of making SharePoint create real value in their organization. Showing users exactly how to performing many detailed tasks in SharePoint, this Guide will help your users accomplish real projects and deliver useful functionality in SharePoint. As one of the hottest SharePoint 2007 reference guides, this book has been highly acclaimed by many industry professionals as the best guide to own for end users. You can purchase the book from Lulu.com or Amazon.com. Lulu.com also offers a full color version for sale. The SharePoint Shepherd’s Guide for End Users: 2007 contains over 116 detailed tasks to help users create powerful SharePoint applications for their organization. The following is a list of many of the tasks outlined in the book. 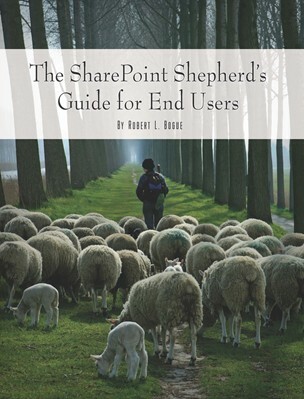 What is The SharePoint Shepherd’s Guide for End Users?